GIVE ME ALL THE CARBS AND NONE OF THE CRUELTY, PLEASE! Now listen my main motivations for following a whole-foods-plant-based diet are for my health. However I do care very much about our planet and all of it’s inhabitants so now that I have eaten this way for a while I really cannot disconnect the animal from the plate, if you know what I mean. I know that not everybody feels this way and that’s okay. I am not here to vilify other people’s choices or feelings. I am here to make delicious plant based foods that fill us up and make our bodies feel good! So with all of that said, one of my husband’s previous go-to dishes was shredded pork anything. Tacos, on top of burgers, or just a big ole plate of BBQ. That was his favorite thing to eat while dining out. Now I REALLY like to try to replicate flavors of some of our old favorites and this recipe was actually his idea! The idea of BBQ sweet potatoes is probably not all that unique but I wanted to see if I could replicate the texture of shredded pork using a vegetable. Nowadays jackfruit is a wonderful and similar substitution but long before jackfruit came on the scene I was shredding sweet potato and slathering on a delicious BBQ sauce and calling it good! Obviously the texture isn’t identical but it gets the job done, it is delicious, and a fiber filled sweet potato will keep you satisfied and feeling good! I’m going to get a little cheesy for a minute here but look how beautiful sweet potatoes are?! I mean come on with that color. Sometimes I’m so amazed at the color of the food we get to eat. And if something looks that beautiful that is created in nature then you have to believe it’s gotta be damn good for us, right?! Okay back to the recipe! This could not be easier to throw together. AND it’s made even easier if you use a store-bought or pre-made BBQ sauce! This time I decided to use a recipe by Emilie over at Emilie Eats. Since making the sweet potato is so easy I figured why not go the extra step and whip up a homemade sauce?! I would definitely recommend this recipe-it’s easy and the flavor is incredible. Plus you know exactly what it’s made from-no weird or scary ingredients! Shred those sweet babies using a hand grater, or if you have a grating attachment for your food processor then this will be done in minutes! Slater those softened sweet potato shreds in store-bought or homemade BBQ sauce! Layer it up on top of a burger, eat it between some toasted english muffins, on a big plate of southern fixins’, or might I suggest TACOS. 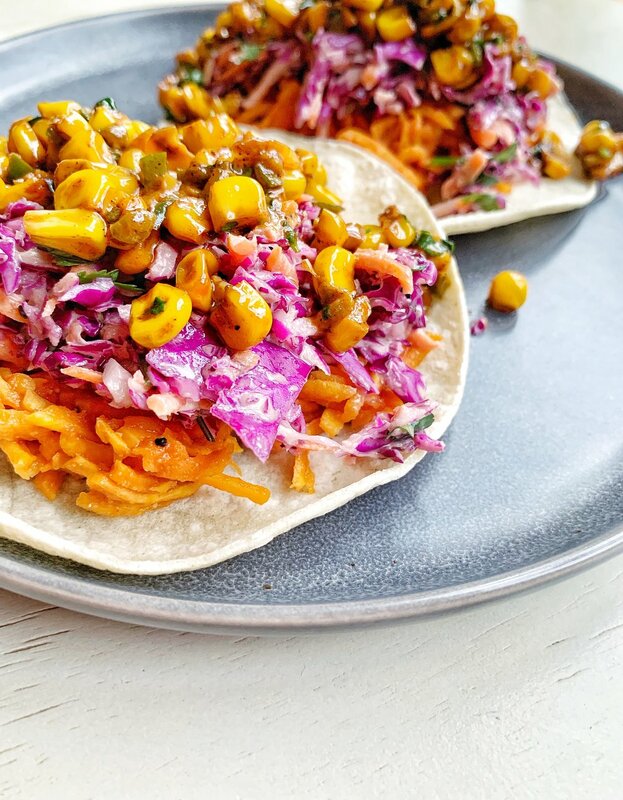 Because tacos are always a good idea, amiright? I would HIGHLY recommend topping these bad boys with some extra special taco toppings! 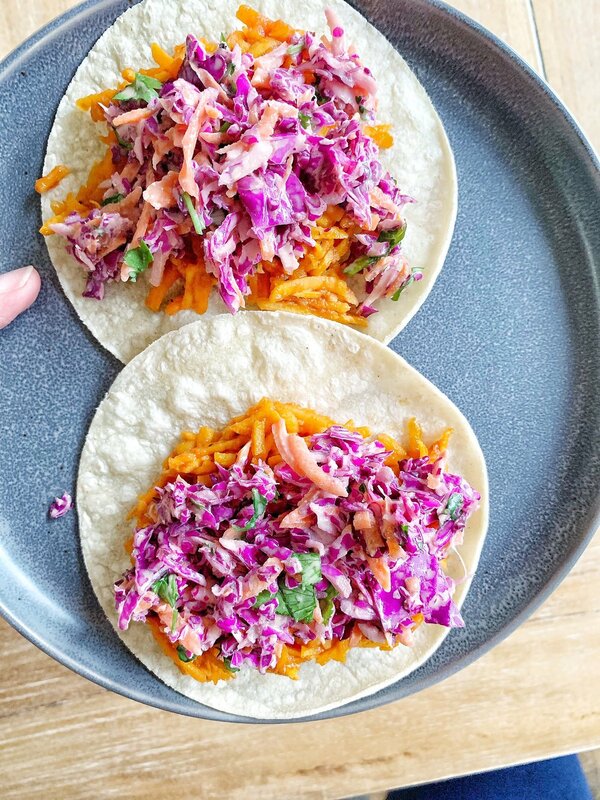 Try this red cabbage slaw and/or this Mexican Street Corn and you will not be sorry! This is really as easy as easy gets. 2 Steps until sticky, sweet, BBQ is on your plate! Customize it with other yummy sauces, add some spicy jalapenos, or maybe use a vinegar or mustard based sauce?! However you decide to enjoy this easy and versatile dish, I hope you absolutely love it! Peel and shred your sweet potatoes. To a large sauté pan, add about a couple tablespoons of oil or vegetable stock and start to sauté your shredded potatoes. This will take about 8-10 minutes. You want the sweet potato to be softened. Add about 1 cup of your BBQ sauce to your pan and mix so the potatoes are covered. This is where you can decide how “saucy” you like your BBQ! Add more or less to your liking! Any excess can be added on top of your dish before devouring! <li data-preserve-html-node="true" class="instruction" itemprop="recipeInstructions”> Toast up some buns or English muffins, cook up a quick batch of my Mexican Street Corn and/or Easy Vegan Slaw and make some tacos, slather on top of a veggie burger…eat this however you would eat any other type of BBQ and you will not be disappointed!